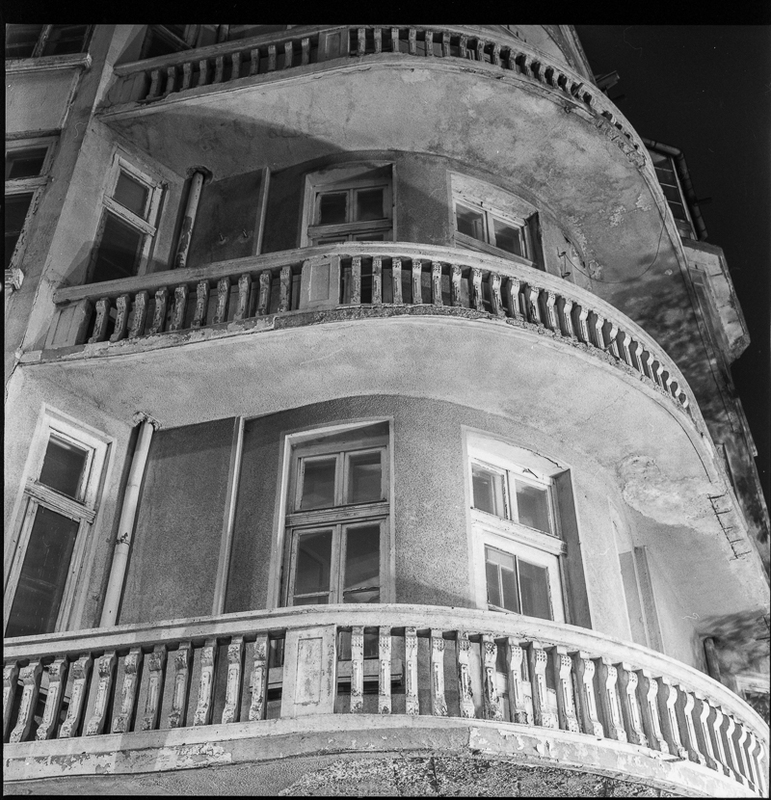 One summer, a little over twenty years ago, I took to wandering the streets of Sofia, Bulgaria late in the evenings, with a medium-format camera and a light-meter slung over one shoulder and a heavy tripod balanced on the other. At the time, I was entranced by the interplay between strong artificial streetlight and the textures of well-worn building facades and the way it registered on high-contrast black/white film pushed a stop or two beyond its rated sensitivity. Among my favorite subjects, then as in recent years: balconies. As I’ve mentioned in previous postings, Sofia was and still is a city of balconies: wrought iron, wooden, concrete, and plaster. Two decades ago, however, just as today, most of Sofia’s balconies appeared empty, even on springtime and summer evenings. Life had turned inward, so it seemed, and had yet to reemerge. The social function of balconies as an interstice between the private and public realms had ceased, with nobody observing public life from balconies nor conducting their private lives in view of neighbors or passersby. Instead, a sharp, albeit invisible, dichotomy arose between public and private and indoors and out. The source of this dichotomy is by no means a mystery. Factors include a rise of urban anomie in general, a search for privacy and an over-reaction against the pressures and intrusions of the public realm during the communist period, and the absence of social cohesion and trust in the time since. The replacement of physical interaction and neighborhood connections by internet-based social networks also plays a part, as does the out-dated confusion of gated isolation with status. For an in-depth examination, both of the history of Sofia and matters of public vs. private space in general, I recommend urbanist Sonia Hirt’s excellent book, Iron Curtains: Gates, Suburbs and Privatization of Space in the Post-socialist City, which I have been savoring chapter-by-chapter over the past year. Good observations all, and so very depressing. The repercussions of all this anomie and “mine vs. yours” mentality are surely not unrelated to the current hysteria over immigrants and rightist/nationalist/populist movements in Europe and in the United States.